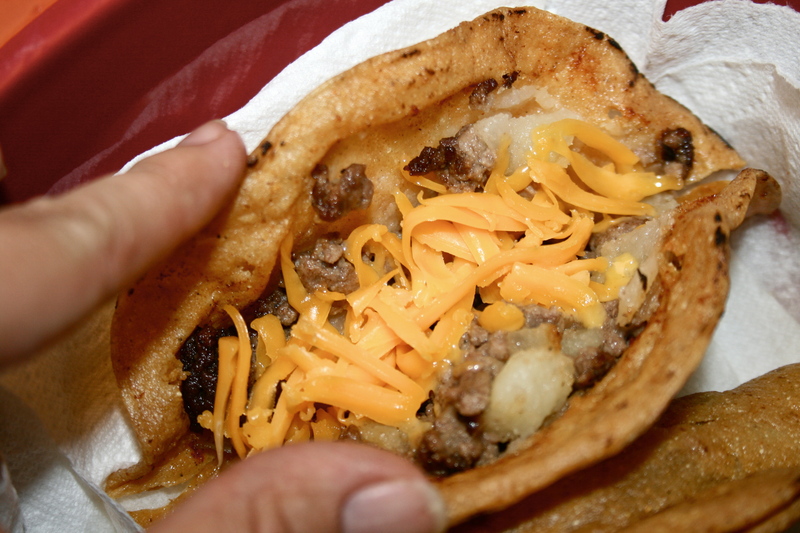 Ground Beef and Potato Tacos… top it with a dill pickle for happiness. I was under the impression everyone knew how to make hard shell tacos. My tia makes killer tacos, my future mother in law makes delicious tacos, my nina makes yummy tacos. Hell, even my neighbor who never cooks makes decent tacos. It’s a Mexican staple that has gone global, or at least I thought so. Not to long ago I went to a party and lo and behold, tacos were being served as the main dish. Unfortunately this party thrower missed the mark COMPLETELY! The crazy part is this person is a excellent cook and all the other dishes served were really good, so I couldn’t chalk it up to this person not knowing their way around the kitchen. It made me realize maybe I’m taking the hard shell taco recipe for granted. I decided to make the most commonly made taco in my neck of the woods, which is carne molida con papa (ground beef with potato). Take this ordinary taco and add some cheddar cheese and a dill pickle to the top to make it extraordinary. Yes…. I said a dill pickle! Fill a medium pot with water to the halfway mark, then place over a medium high flame. Bring to a boil. 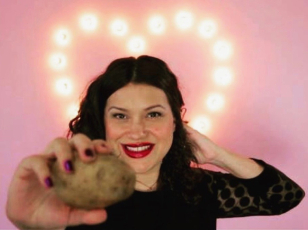 Take your two potatoes and peel and dice them. Boil for 10 minutes. Remove from flame and drain. Set to the side. In a large frying pan over a medium flame add olive oil and allow to get hot. 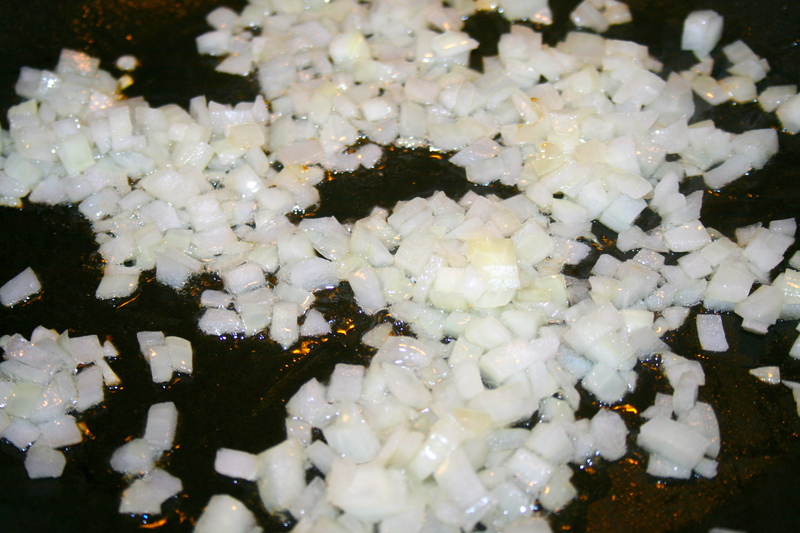 Then add onion, and saute for 5 minutes. Mix your onions around every so often so they don’t burn. 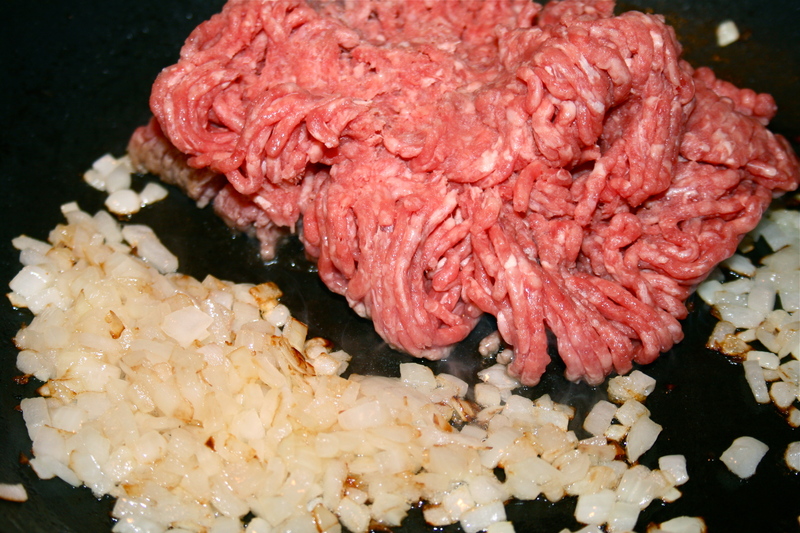 Once your onions are a bit translucent add the ground beef, and mix into the onions. Then add garlic, salt, black pepper, oregano, and ground chipotle pepper. 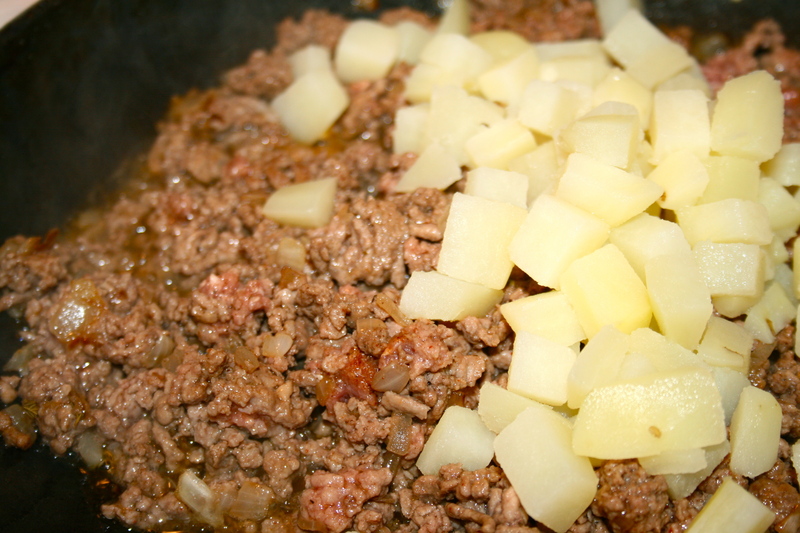 Mix well and cook for 7 to 10 minutes or until ground beef turns brown. 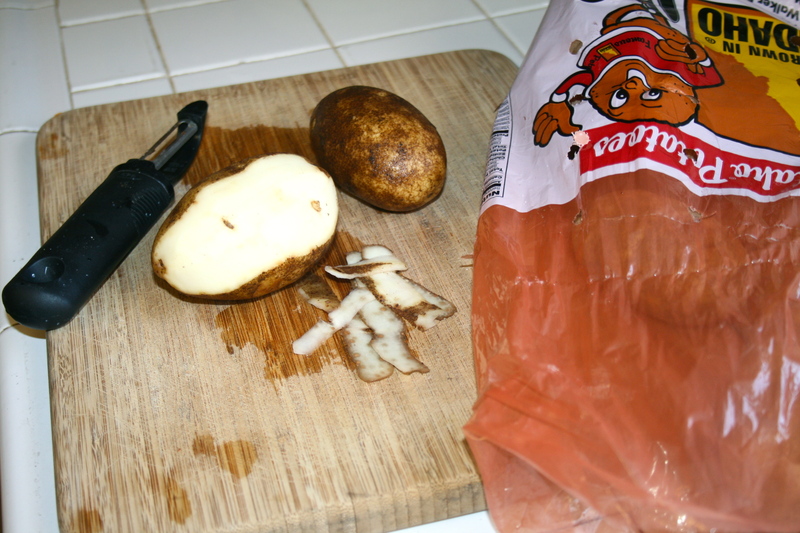 Then add boiled potatoes to the gound beef mixture. Mix well and remove from flame. Place in a bowl to start assembling your tacos. Warm your each corn tortilla on an open flame for 15 seconds on each side. Then place them in a towel to stay warm or a tortilla holder. This step will keep your tortilla from breaking. Let’s start making tacos. 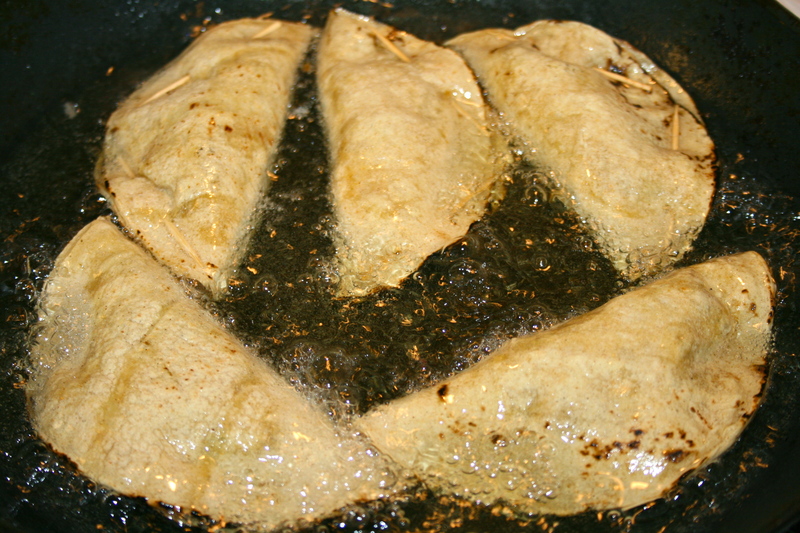 In a large frying pan over a medium flame add vegetable oil and allow oil to warm while you assemble your tacos. 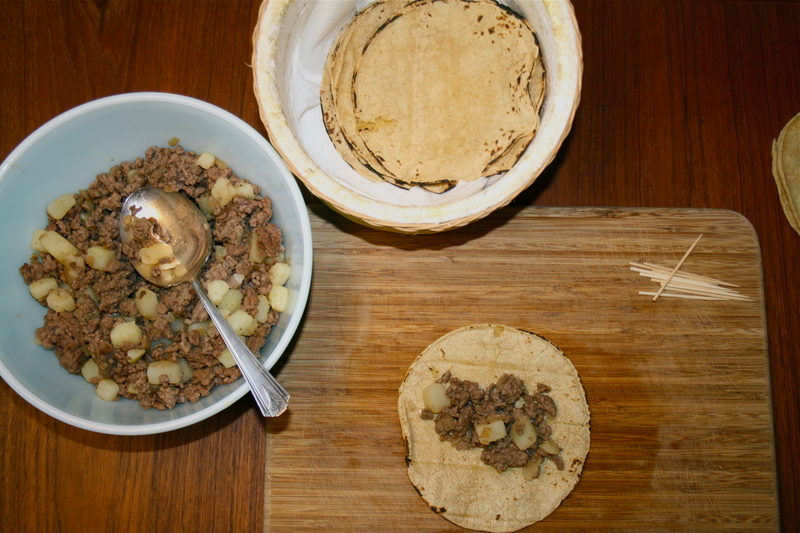 Take a warm corn tortilla and fill with 1 1/2 tablespoons ground beef and potato mixture. Place the filling in the middle for easy folding. 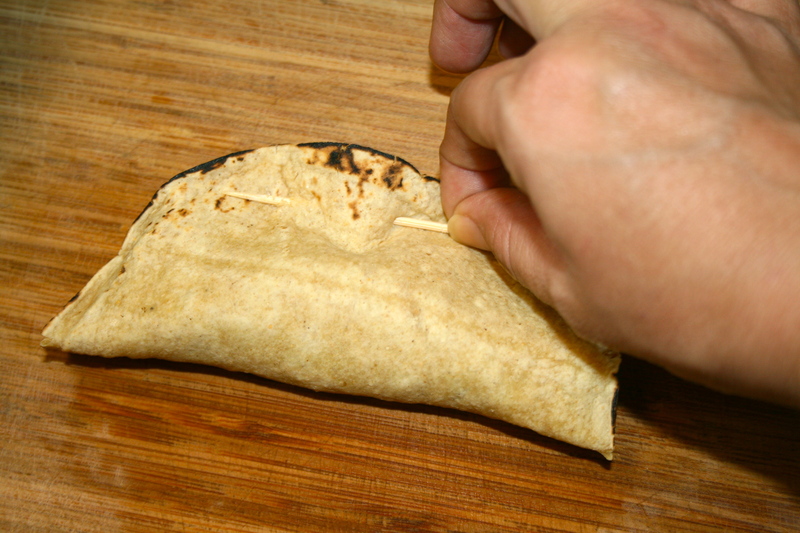 Then fold tortilla over and close taco with a toothpick right in the middle or use two toothpicks along the side. Continue till done with all tortillas. Your vegetable oil should be hot by now…. take your tacos and fry them up. About 5 minutes on each side or until gold brown and shell is hard. That’s it your done. Remove toothpick closure, and fill with your favorite toppings. For me that is a pile of cheddar cheese, some delicious red salsa, and a dill pickle….. If I’m feeling really adventurous I will add pickled jalapenos too. Enjoy! My breakfast with Poty, Nescafe and a beautiful mug giveaway. My food interview with the sensational, inspirational – Kim Deal of The Breeders/Pixies. Yup, I said food interview! That looks so yummy right now. Gonna crave it for lunch. The flavors interact so well. This is something my kiddo would just adore and eat every day! Did you just ask who wants to come over for dinner! What!? I’ve done this before but never thought about frying them like a little pocket! Omg…hubby would love that! Lol. I’ll have to get on it! 😉 Thanks for sharing this recipe! 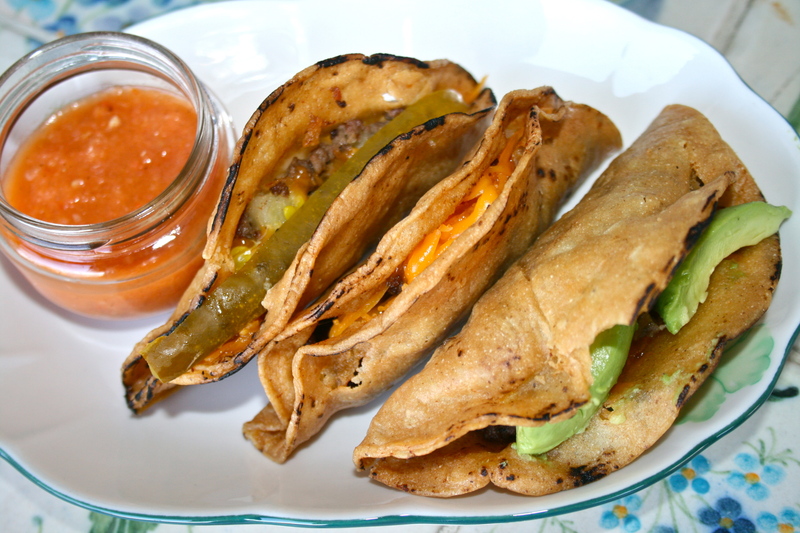 if you can’t make a decent taco, then we need to get them like the taco 101 book…. these look good. a pickle sure sounds interesting! Wow! What a unique dish! Looks really yummy. pickles, love it!! i think people assume they know what a taco is… lol love the toothpick idea, my kids would love this..
My husband, the potato King, will be very, very happy. What should I bring? A bottle of vino? You break down recipes step by step, and add easy tips, i.e. the toothpick. Of course! Another winner! Another great combo idea — Yum! I love everything about this post except the pickles, but I could be wrong. Tacos are indeed a favorite! My mother used to make something like this, but she didn’t pre cook the meat, it was cooked inside the tortilla while it fried. Those were the best tacos. This is exactly how my mom cooks them and she never forgets dicing some pickles for us! So glad to see this recipe!